JUST RELEASED: “The Spirit Of The Brotherhood” - the companion DVD to “Free Spirits.” Nine former commune members discuss the spiritual experiences and beliefs they shared back then that still influence them today. They thought there was no “I” in commune! 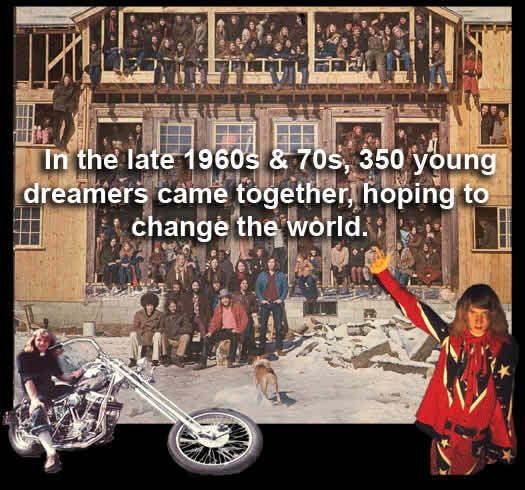 The incredible story of the Brotherhood of the Spirit/ Renaissance Community commune, one of the largest, most controversial intentional communities/ communes/ eco-villages of the 1960s and 70s, and its flamboyant founder, Michael Metelica Rapunzel. Official site for Acorn Productions LLC and the documentary film, Free Spirits, directed by Bruce Geisler, about the Brotherhood of the Spirit / Renaissance Community commune, one of the largest and most controversial New-Age intentional communities of the 1960s and 1970s, and its founder, Michael Metelica Rapunzel. The final re-editing, color correction, and soundtrack remix are done, and won a prize for “Best Original Score” at the Oxford International Film Festival. “Free Spirits” broke the house record at the 800 seat Academy of Music Theatre in Northampton, Massachusetts during its two day special preview run and got great reviews!